Have you visited the Charmedseed Jewelry store at ShopLately? ShopLately is a great resource where sellers can easily offer sales on some or all items in their store and even be featured on the website! I relish my nerdiness. I delight in my geekiness. I also like modern style and fashion and tend toward a more Anthropologie-styled look – very bohemian, soft, and layered. My home tends to be similar as well, with a strong industrial-modern flair (I like to think our Bexley bar from World Market exemplifies our home style), but I still want subtle bits of our passion for fandom to show through. While retailers like Black Milk have fantastic and quality garments, their sleek sheath dresses aren’t really my style and don’t work for my everyday school-wear as a teacher. I am a scarf-wearing fiend. 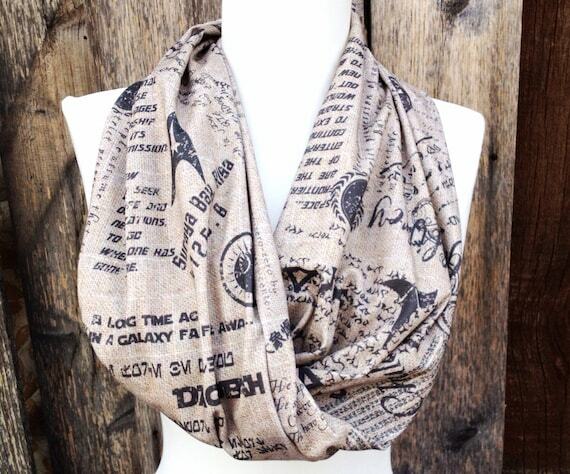 So this multi-fandom organic cotton infinity scarf really tickles my fancy! Featuring a whole host of beloved fandoms, it’s sure to delight any hippie-nerd (nippy? herd?) with the aged print style and gauzy fabric. My husband would not consider himself fashionable, but I like to pick up tee shirts for him pretty regularly, and nerdy shirts are never turned down. 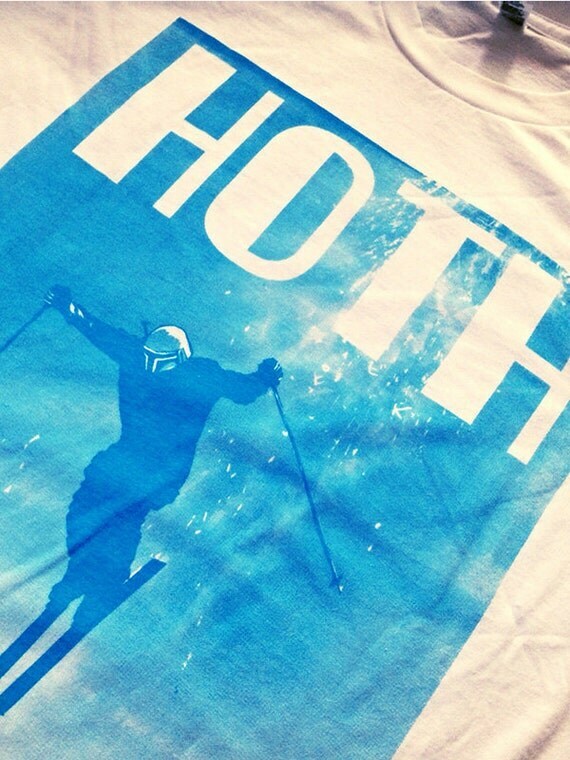 His (and my) favorites are the subtle nerd humor styles, such as this “Ski Hoth” shirt emblazoned with a 70s style skiing advertisement. Fortunately tees like this one are very trendy and can even be found at retailers like Target. Retailer Her Universe specializes in geek chic for women and girls. Envisioned by the charming Ashley Eckstein, actress and voice of Ahsoka Tano in Star Wars: The Clone Wars, Her Universe has put forth a great collection of clothes and accessories from all our favorite series. I’m especially fond of their jewelry line, simple and elegant pendants that can add that subtle bit of flair to any everyday outfit. My husband and I did the same thing with our wedding. We wanted a very sweet, traditional event, yet we couldn’t help but include a few references here and there. My “something blue” was a Jedi Order temporary tattoo in place of the more traditional garter; Nick gifted his groomsmen with Star Wars themes cufflinks. I made the little wooden cake-toppers. I walked down the aisle to “Dearly Beloved” from Kingdom Hearts. 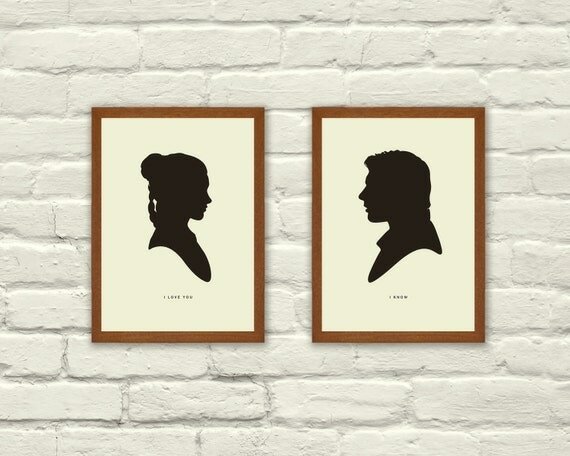 Finally, we received this absolutely perfect gift last Christmas from my sister-in-law, this adorable set of Han & Leia silhouette prints. They now reside charmingly in our master bedroom. How do you show off your nerd? Thank you to Shopfreak for featuring one of our customized leather cuff bracelets today! New jewelry pieces – frame your world! These new wordspell pieces are just what you need if you’re looking to change your outlook… just gaze through them! Both are available for purchase and immediate FREE US shipping at our Etsy store! And don’t forget – you can always request a custom piece if you’re inspired by another word, phrase, or metal. Custom piece prices run the same as our retail prices! You know what they say… new friends are silver… but what kind of silver? Typically I like to think of them as sterling. Sterling silver is an alloy (a mix of metals) of 92.5% pure silver and 7.5% of another metal, usually copper, although other metals can be used, too. Why do we do this? Like gold, silver in its pure form is very soft and not suitable for jewelry or other hard-wearing accessories. Just that little bit of other metal will make for a harder substance, and thus a more durable piece. That 925 you see stamped or otherwise marked on silver jewelry? That denotes it as sterling silver – 925 is just short for the 92.5% of silver metal in the alloy. Sterling silver stamping blanks available for purchase on Etsy. Fine silver is 99.9%, and can be seen in jewelry usually as a final plate (a thin layer chemically or electrically bonded to the outside of a piece) around sterling silver. Like gold, it can eventually wear off and need to be re-plated. Almost any jeweler can do this for you. I love working with sterling silver. Silver has the unique quality of being a very bright, white-color metal. Other metals that mimic silver just don’t have that bright white shine and the true depth of silver. It’s a great material for heirloom pieces, because silver retains value in the same way as gold and platinum (if not as MUCH value). A sterling silver necklace from Charmedseed Studios available for purchase on Etsy. Silver will absolutely tarnish! All metals will tarnish or oxidize because of normal chemical processes. Sterling silver will tarnish a little more if the alloy is made with copper. Fortunately said tarnish can be cleaned easily with a polishing cloth, chemical cleanser, or abrasive physical polishing – that’s right, the old elbow grease. Do you have a metal allergy? Sterling silver will probably be okay for you to wear, as long as the other metal in the alloy isn’t your allergy-metal (such as nickel, a common allergy-inducing metal. Fortunately since most sterling silver is made with copper, you’re okay). Got questions about sterling silver jewelry or other metals? Ask me! When you just feel like cussing? Swearing? Sharing a few choice expletives? Well, try this on instead. Five round, polished copper charms feature individual stamped characters @#&*!! humorously suspended on copper chain. Lobster clasp, adjustable 15″-18″ length. Perfect way to express your frustration or make people laugh! Would you like one in another metal (or several metals)? Contact me for a custom piece – it’s the same price as this version! Love this one? Pick it up for just $32.00 USD at our etsy.com store. I don’t often do beaded jewelry anymore as the market is just SO saturated with beaders, but if a commission is asked for I’ll jump at the opportunity! Here’s a recent one I did; requested was a mermaid theme to go with a dress the wearer had made. We decided on pearls with a little bit of sparkle! Click on the image above to see more images at the Charmedseed Jewelry Facebook page!